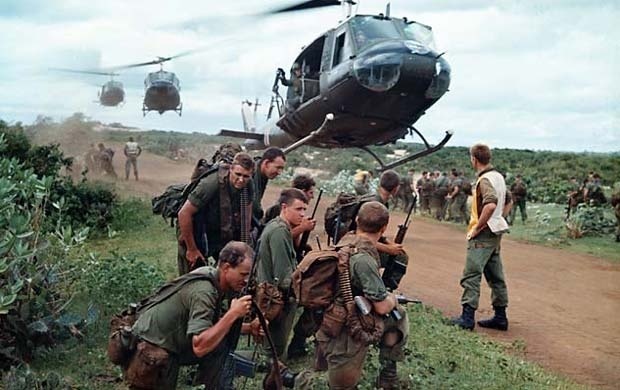 Although Western involvement in the Vietnam War ultimately drew to a close over 40 years ago, the spectre of the bloody, brutal and still divisive conflict still looms over the U.S. and the country's current involvement in foreign affairs. The title of Peter Davis' highly affecting documentary is taken from a quote by then-President Lyndon B. Johnson: "the ultimate victory will depend on the hearts and minds of the people who actually live out there." The film opens with archive footage of this speech, and proceeds to show a country eventually devastated by napalm, Agent Orange and an assortment of other weapons designed to inflict maximum damage. The people became an afterthought in the quest to distinguish the 'Commie threat'. Hearts and Minds is blatant propaganda, but its raw power is undeniable. The film had a difficult road to winning the Best Documentary prize at the 1974 Academy Awards, namely due to Columbia Pictures withdrawing their desire to distribute the feature after one of the interviewees, former National Security Advisor Walt Rostow, claimed that his participation had been misrepresented and his words taken out of context. The producers eventually purchased back the rights to the film, and ran it for just one week in theatres (the minimum time required to be eligible for awards season). It's legacy understandably invites mixed responses, with many criticising the one-sidedness of the film's views, the clever film-making techniques, and the lack of context given to those who may defend U.S. involvement in Vietnam, or be actively in favour of it. This is particularly noticeable when documenting former POW George Coker's return to his home country, where his vocal disdain for the Vietnamese race is documented without taking into account the terrible treatment he no doubt suffered at their hands. Davis clearly has an agenda, and uses propaganda tools to make his point. The most powerful of which is the rather sickening view of General William Westmoreland that life on the Orient is cheap, while images of a grieving wife attempting to throw herself onto her dead husband's coffin are juxtaposed with the interview. Soldiers who went into the war with a hatred for the enemy they didn't know soon lost their hunger and started to question their involvement, especially after seeing many of their comrades lose their lives and the grisly effects their chemical weapons were inflicting on innocent children. Hearts and Minds succeeds in capturing the turning point in the war for the people at home in the U.S., when attitudes started to shift as it became clear their government didn't have a clue how to win it and the pro-peace movement erupted across the country. The archive images pack incredible power, and the interviews with veterans are undeniably moving, especially when the camera reveals the lasting effects the conflict has had on them. This is documentary film-making at its most complex and admittedly biased, but regardless of your opinion going into the picture, it will certainly leave you questioning events and wondering if any lessons have been learnt.